Walter Harold Wirfs will be taking his rich baritone voice and his close harmonies to sing with better angels when he passed away this Sunday, March 17th, 2019 at Avamere Court in Keizer. Four days earlier, on his 96th birthday, Walter and his barber shop quartet gathered with many of the Avamere residents for a birthday party sing out, sharing their mutual love for music. Who would have known that it was their last chance to sing together? 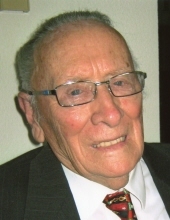 Walter was born on March 13, 1923 in a small house on the family farm near Dayton, Oregon, where he worked with his siblings and cousins, attended a two-room school and graduated from Dayton High School just after WWII began. He briefly worked in the Portland Shipyard before joining the United Stated Navy, with primary assignment to Naval Aviation on Kodiak Island, Alaska. Returning home he met and married the love of his life, Thelma Luana Tucker. While he attended college, they began a family of two boys. Following post war jobs and with a young family in tow, they moved to Tillamook, Oregon, where he worked for the Tillamook County Creamery Association. They were active in the Tillamook Methodist Church and in community organizations. In retirement Thelma and Walter moved to Salem, Oregon where he returned to his life-long passion of music, joining the Breeze Barbershop Quartet. He is survived by sons Walter and Mahlon, daughters-in-law Charlotte and Patricia, grandchildren Denise and Steve, Carolyn, Matthew and Cynthia and two great grandchildren. He is preceded in death by his wife, Thelma; father, Peter; mother, Mary; and siblings Ray, Clifford, Alice and Estela. To send flowers or a remembrance gift to the family of Walter Harold Wirfs, please visit our Tribute Store. "Email Address" would like to share the life celebration of Walter Harold Wirfs. Click on the "link" to go to share a favorite memory or leave a condolence message for the family.